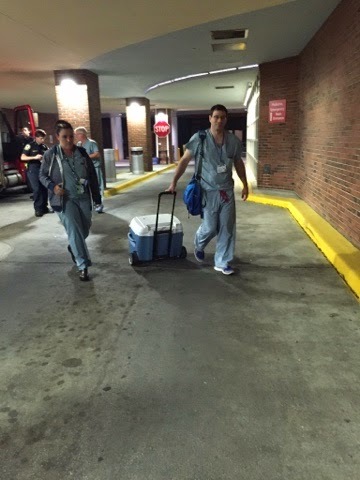 The first incision to prepare Rachel for the arrival of her new heart was made at approximately 1:30 AM on May 6, 2015. Earlier in the day, part of the transplant team had already made their way to the site of the precious donor who would ultimately bring life to Rachel through their beating heart. It wasn't until the team had arrived there and actually gotten a good look at the heart that the final decision was made as to whether they would accept or decline this gift for Rachel. It was perfect! Surgery was a "Go"!!! The extaordinary redemption of what was broken had begun! I honestly don't know what I did during those hours... I talked to Doug several times through out the night, before he boarded a plane to the capital city of India, and I tried to busy myself in updating my friends and family as they waited with me near and far. But mostly, I spent the night alone in what would be Rachel's hospital room for her entire recovery, and I waited for news. Everyone encouraged me to get some sleep while I had the chance, but I could not imagine sleeping while my little girl fought for life just a few floors below me. There would be time for sleep later. Instead, I laid down on my recliner bed and literally visualized myself laying in the lap of God. I am a lover of words, and I am rarely without any, but on that night, I couldn't find a single word to say to the Lord that hadn't already been said. Tears came instead. I knew God understood those better than words, and I found comfort lying there with Him and allowing my emotions to overflow in tears of joy and grief mingled together. My heart literally agonized for a mother I didn't even know. I have prayed for her for over three years now... wondering who this unknown hero might be that would ultimately share life with my daughter. Tonight it didn't matter. I knew that wherever she was, she was hurting, and I was hurting with her. I wept because I knew that in those very hours her child would slip into eternity and leave a vacant place in her heart, while hope for more time with my child would be born in mine. I was overwhelmed with the unfathomable thoughts of God that I am certain I will never understand. Why her child? Why not mine? Why should I receive? Why should she lose? The gravity of such an exchange from one mother to another unleashed emotions from within me that I didn't know existed. The anesthesiologist caring for Rachel in the operating room was kind and kept his promise to update me frequently throughout the night with news of how surgery was going. He was most gracious to let me know precisely when they expected Rachel's new heart to arrive at the hospital and I intended to be there when it did! 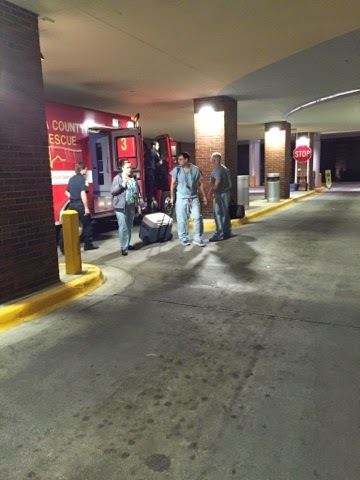 So, at 4:30 AM, our weary crew gathered outside the emergency room entrance of the pediatric unit of Shands and huddled in blankets as we waited for the ambulance carrying our precious gift to arrive. I could not stand still, so I paced up and down the sidewalk, hardly breathing until the ambulance finally rounded the corner and made it's way toward me. An ordinary ambulance delivering HOPE for my daughter! 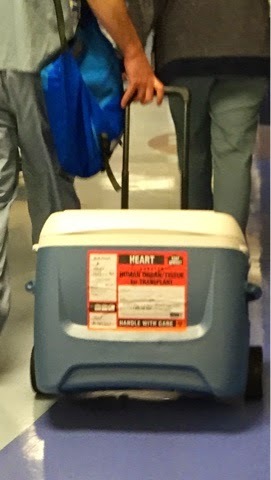 The transplant team and surgeon carrying the heart jumped out of the ambulance and hurried past us with great urgency. They seemed amused that we were waiting there, as if this were unusual, but they didn't stop us from following, so you can bet we DID! I remember saying something to the surgeon as he hurried by about "my daughter's new heart", but otherwise no one said a word! 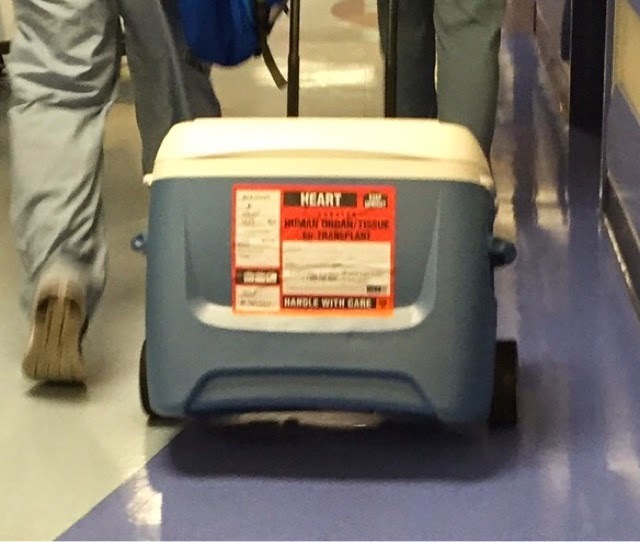 I was so fixated on the cooler rolling in front of me with the simple words "Human Organ for Transplant" and "HEART" stickered on it, that I'm not even certain I was breathing! 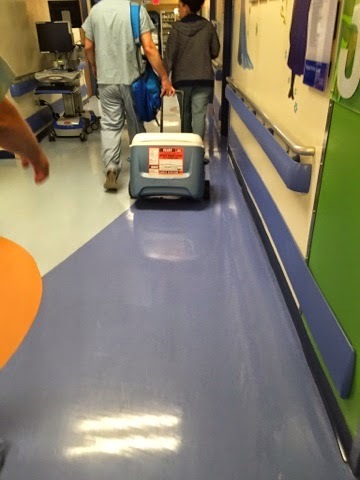 We followed the transplant team and that beloved cooler right through the Pediatric Emergency Room and as far down the hospital hallways as they would allow us to go before a door finally closed behind them and they disappeared into an elevator that would take them and this extaordinary gift of HOPE to the operating room where my daughter was waiting. No one spoke a single word. I just stood their in the hallway of the hospital at 4:45 AM and I sobbed. All of the uncontainable emotions within me collided and spilled out. This extraordinatry gift, and the indescribable loss that it represented, ...delivered in an ordinary cooler. The sight of it and everything it represented literally knocked me to my knees! I am struck at how God has always chosen the ordinary through which to perform the extraordinary. Maybe that's why we miss Him so often. Even God's saving HOPE in the gift of His Son was delivered to the world through the ordinary! Can't you see it? Extaordinary HOPE through the ordinary! I saw Him again tonight when extraordinary HOPE arrived for my little girl in an ordinary cooler! Your telling of Rachel's new heart has brought me to tears. In a good way. Faith. Hope. Love. Charity. I can easily see why this is such a spiritual journey. I'm sure that knowing her child's heart brought life to another child is brining comfort to this mom who has lost her child. It might be the very thing that helps her through her grief - one never knows, but I, too pray for her, that she is comforted. Thank you so much for sharing this intimate moment in your life, the videos of your husband with Rachel and how you mustered your strength and surrendered to Him in your hours of need and found compassion for the mother who lost her child and also comfort. I know the road after transplant is still long and hard. I'm continuing to pray for you and Rachel and your family and the donor's family. So unfathomable...thank you so much for sharing this incredible journey with us..I wait with bated breath for pictures of Rachel and her new heart!! !